November 18, 2010 - Air Malta categorically denies the recent media report saying that the airline is planning to dismiss 1000 employees. Air Malta confirms that leading international consultants from Ernst & Young have been engaged to draw up a restructuring plan to ensure the long term viability of the airline. A substantial number of airlines in Europe have over the past years and months undergone similar restructuring processes to ensure long term sustainability in an ever increasing competitive aviation market. Ernst & Young were instrumental in assisting other industries, including airlines, in similar circumstances to embark on the road of long term viability. The airline also points out that speculation on its financial performance for the current financial year are premature particularly since the current financial year ends in March 2011. Formal discussions with the unions have already started and the airline will also be communicating directly with its employees to update them on the developments. Air Malta has stressed that a substantial number of airlines in Europe and around the world have been engaged in ongoing restructuring ever since the tragic events of September 11, 2001. Air Malta further stated it is not immune to the challenges being faced by the aviation industry and has been carrying out a structured restructuring exercise since 2003. The airline points out that since 2003, it has managed to reduce its staff compliment by over 600 without resorting to dismissals. ?During this sensitive time, Air Malta would like to appeal for factual and prudent reporting in the media as speculative and wrong information ? as has appeared in the media this week could lead to wrong perceptions or misconceptions which could be commercially damaging to the airline?. In the early 1970s the Maltese government made a call for an international airline partner to help set up an airline. Pakistan's PIA was selected and a new carrier set up. The name chosen for the new airline was similar to that of its forerunner, Air Malta Co Ltd, and was established on 31 March 1973. 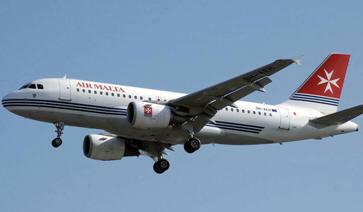 Both Malta Airlines and Malta Aviation Services were taken over by the government and the private owners were given a shareholding in Air Malta Co. Ltd. Air Malta is owned by the Maltese government (98%) and private investors (2%). Air Malta also has a 25% shareholding in Medavia. The airline employs 1,380 staff. Air Malta started operations, with two wet leased Boeing 720Bs that served Rome, Tripoli, London, Manchester, Frankfurt and Paris from Malta's airport. It later bought three more Boeing 720Bs and bought the original two. According to the Association of European Airlines quarterly review of May 2006 Air Malta is the airline that loses the least amount of passenger baggage. The amount of baggage lost in the first quarter of 2006 was 4.1 bags missing per 1000 passengers. Between 2002 and 2007, Air Malta embarked upon a fleet replacement program, opting to change all aircraft to Airbus A319s and A320s, thus reducing the average age of the fleet to around 2.5 years. The last aircraft in this order, A320 9H-AEQ, was delivered on 22 March 2007. Air Malta has around 190 interline ticketing agreements with other IATA airlines. It has a codeshare agreement with Qantas covering the following routes: Sydney Singapore Heathrow Malta, Sydney Bangkok Heathrow Malta and Melbourne Singapore Heathrow Malta.